I'm challenging myself to name 100 ways to celebrate 100 days. So, here goes . . .
Estimate how far 100 feet is, student feet, that is. Using sticky notes with their names on them, have your kiddos place their notes where they think 100 feet from the classroom door will be. Have your students trace the outline of their shoes on construction paper and cut them out. Then line them up, heel to toe in the hallway to determine the correct answer. Give a certificate to the student(s) who came the closest to the correct distance. If your students are capable, have them figure out how many construction paper feet each one needs to make using operations. If they are not able to do that much math, have them count off by 2s, making tally marks or holding up fingers to track how many times they gave the next number in the skip counting, thus determining how many sets of footprints to make. Give each student a 1 quart ziplock bag to take home. Direct them to find 100 of the same item to put in the bag and bring them to school on the 100th day. Stress that all items must fit in the bag and that are dear or valuable are to be considered carefully as their collections will be manipulated during the day. Thus, there is the risk that breakables could be broken and valuables lost. My personal preference is that they not bring in food that will attract bugs or vermin. Read 100 Hungry Ants, by Elinor J. Pinczes. Save the ads from your Sunday newspapers and bring them to class. Challenge your students to find ONE item they could buy if they had $100 without going over $100. Ask them to record their purchase on a $100 bill representation. Then ask your class to find 2 items they could buy without exceeding their $100. Again they should record their purchases. Repeat the task with as many numbers as you deem appropriate. I recommend 4, 5, and 10, at the least. Bring in 3 jars (mayonnaise jars work well) that you have filled with a collection of objects. Make 1 jar = exactly 100. Make the other jars greater than and less than 100. Ask your students to vote for the jar they think has exactly 100 objects. Near the end of the day, count the objects in each jar to determine who selected the correct jar. 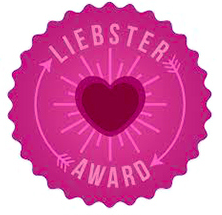 Give certificates to those who guessed correctly. 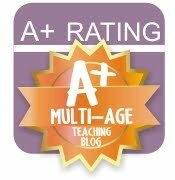 Have your students determine the year in which they will turn 100 years old. Discuss signs of old age. Have your students draw a picture of themselves as they will look at 100. For extra effect, have them crinkle the paper after their drawing is complete to make their faces look wrinkled. Read Miss Bindergarten Celebrates the 100th Day of Kindergarten, by Joseph Slate. Ask your students to write a paragraph about what they think they will be doing when they are 100 years old. 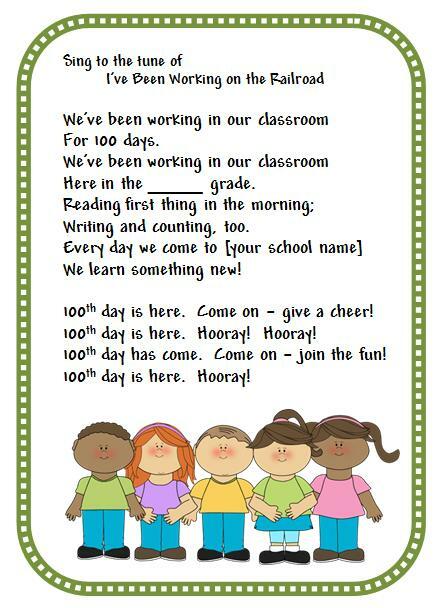 Prior to 100th day, begin compiling a list with your students of 100 words they can read and write. On the 100th day, have a spelling bee using those words. For older students, challenge them to name 100 words that pertain to a specific subject (science, math, social studies, food, nouns, verbs, ...). Use those words for the spelling bee. Promote team work by providing several 100 piece jigsaw puzzles. Divide the class into equal small groups; then give each group a puzzle to complete. Certificates to those who finish first! Thumbs up to thumbprints! Using a stamp pad, their thumb, and a marker, students will print their thumb on paper 100 times. Each time they make 10 thumbprints, they should stop printing and use the marker to circle that group of 10. Encourage them to label each set with the appropriate decade. Calculate what year it will be 100 years from now. Ask each student to draw and describe something that schools will have then that they do not have now. Collate their pages and illustrations into a class book. Give each student a 10 x 10 grid. Flip a penny 100 times, recording H (heads) or T (tails) on the grid cells. Calculate how many Tails appeared in #18; calculate how many Heads came up. On another 10 x 10 grid, have students record the numbers that come up as they roll a die 100 times. Have your students graph the results of #20. 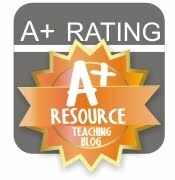 Read 100 Days of School, by Trudy Harris. Have small groups of students make trains with unifix cubes. Each train should be exactly 100 cubes long. Compare the trains. Are they all the same length? If not, which one is correct? The only way to figure that out is to break the trains into equal lengths (I recommend 10). Give certificates to the students who used exactly 100. Brainstorm a list of activities from the 1st 100 days that are memorable. Limit your list according to the age and stage of your students. Create a class graph of their favorite activities. Working with a partner, complete this writing activity: If we had 100 _____, we would _____. The partners write about their idea and then illustrate it. Another writing activity, perhaps more appropriate for older students: Write about what it may have been like 100 years ago. What would not yet be invented? What would school have been like then? 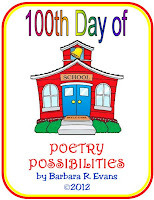 Read aloud The 100th Day of School, by Angela Shelf Medearis. Take a brain break and do 100 jumping jacks. 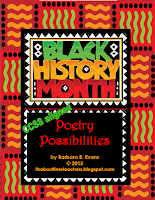 Because the 100th day falls in Feb. in my district, I include a Black History activity. The challenge is to compile a list of 100 African Americans of note. Have a coloring race. Give each students a 10 x 10 grid. Using a die, each child rolls a number and then colors in that many squares. Students should change colors for each roll of the die. Play continues until 1 student reaches 100. If you like, require the children to roll the exact number they need to complete the grid. That is, rolling a 6 when you need 4 to finish will be disallowed. They must roll exactly a 4 or a combination thereof. 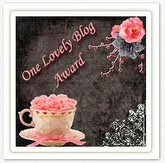 Give the winner(s) a certificate and a pat on the back. Another variation of the coloring race is to give each child 2 dice which they roll together. The number of squares they get to color is the sum, difference, product or quotient of the 2 numbers. It's your choice! After everyone has finished coloring their grid from above, have them cut the grid into the 100 squares. Use the squares to create a mosaic picture. This could be 1 huge, full class mosaic or each students could complete their own picture. Read The Night Before the 100th Day of School, by Natasha Wing. Hop on your right foot 50 times. Then hop on your left foot 50 times. Create paper chains of exactly 100 loops. Join them together with a distinctive loop and hang them around the room. Now you can count by 100s! 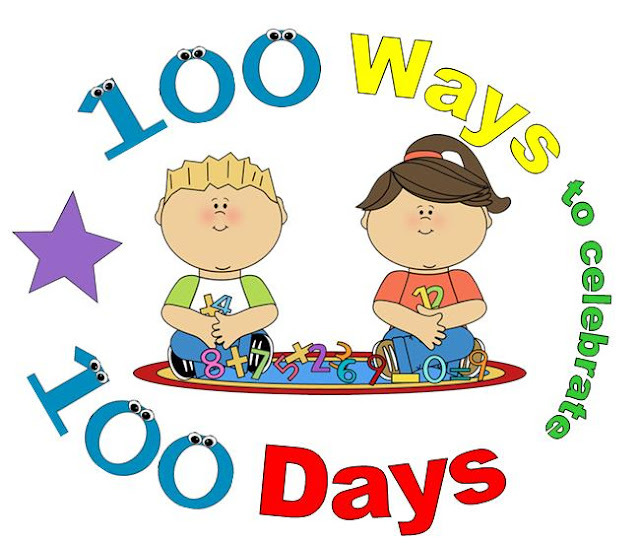 Sing the following song to the tune of Ta-ra-ra Boom De Ay: It's the 100th day/ So shout, "Hip hip hooray! "/ We'll count and eat and play/ on the 100th day. See all we've collected/ 100s on display/ Join in the fun and say,/ "Hooray for the 100th day!" Clip 100 paperclips together. With a partner, measure things in the room. Find 2 each of the following: shorter than, longer than, and equal to the 100 chain. Make 100 placemats and deliver them to a nursing home. I guarantee they will be appreciated by the seniors. If your 100th day is near Valentine's Day, make 100 Valentine cards to send to soldiers who are deployed overseas. Enlist the P.E. teacher to make the children do 10 different in sets of 10 exercises. For example, 10 sit-ups, 10 toe touches, 10 push ups, etc. Have the students estimate how long 100 seconds is. 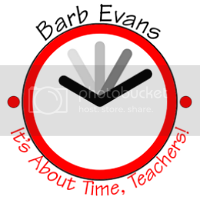 The teacher uses a stopwatch, declaring the start time. Students stand up when they think 100 seconds have expired. The teacher may wish to note which student(s) were correct, if indeed, any were correct. Repeat this exercise at various times throughout the day. Hopefully, the children will get better at estimating the time. Read 100th Day Worries, by Margery Cuyler. Ask each student to list 5 things they are thankful for. Display the lists together under the title, We are Thankful for 100 Things. If you have more than 20 students, have each child name 4 things and complete the list with things you, the teacher, are thankful for. Using long strips of paper (adding machine rolls work great) and 2 different color markers, have pairs of students write the numbers from 1 - 100. For example, 1 = red, 2 = blue, 3 = red, 4 = blue, ... Pairing a student who is struggling with this with a more capable partner is particularly helpful. Have the children create a domino train with 100 dominoes. Then have them watch as they fall down. Using Do-a-Dot paints, have your students make 100 dots on a piece of construction paper. Have each student graph the color distribution of #47. Students complete 100 math problems of whatever operation is most appropriate to the grade level. Read Lester L. Laminack's book, Jake's 100th Day of School. Using Froot Loops, create a 100 loop necklace. Students should use 10 loops of 1 color and then switch to another color for the next ten. Yarn works well for the chain. Give small groups of children 100 paper cups. Ask them to build a wall or structure with the cups. Have the children add their ages together. Did the sum equal 100? Was it larger than 100? Was it smaller than 100? You may want to ask your students to predict the answers to those questions before completing the computation. Give small groups 100 pattern blocks to share. Together they should make a design. 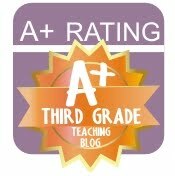 Take pictures of their designs and display the pictures in your classroom. Using the 100 collection the students brought from home, have them divide the objects into 2 equal groups. Use a piece of construction paper folded in half to provide spaces for the groups. Make note of how many objects are in each group. Repeat #56, dividing the objects into 4 equal groups. Note the number in each group. Repeat #56, dividing the objects into 5 equal groups. Note the numbers. Read It's the 100th Day, Stinky Face! by Lisa McCourt. Give each student a 10 x 10 grid. Have them write their first name, putting 1 letter in each square, repeatedly, until the grid is filled. Students then choose a color for each letter and create a key. They then color the squares according to the key. Collect the grid from #61 and combine them to make a large "quilt." Bounce a ball 100 times. Ask the music teacher to help celebrate 100 days by having the children strike percussion instruments 100 times in unison during music class. Give each student a 100 chart. Direct them to color only the odd numbers. Brainstorm a list of 100 things we do at school. 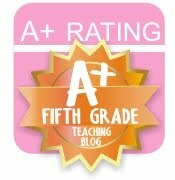 Create a class book in which each student completes a page that reads, "Once I saw 100 _________." 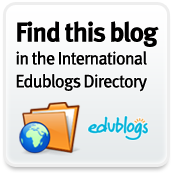 You may wish to share some ideas before turning the students loose. For example, Once I saw 100 ants in my lunch bag. Students should also illustrate their page. Display a large 100 chart. Ask the students how many numbers on the chart have the number ___ as a digit? Repeat with other numbers for as long as is appropriate for the age of your students. Still using the 100 chart, ask how many numbers have 1 digit? How many numbers on the chart have 3 digits? How many numbers have 2 digits? How many numbers have a 5 in the ones place? How many numbers have a 5 in the tens place? Using 100 unifix cubes, make a pattern. Using rubber stamps, make 10 different patterns with 10 items in each pattern. Name 3 things you can eat 100 of at one time. Build the tallest tower you can in 100 seconds. Read Emily's First 100 Days of School, by Rosemary Wells. Write the number 100 as many times as you can in 100 seconds. Solve the math problems in these couplets: 100 thumbs working at the fair. How many fingers are also busy there? Now try these couplets. Some have math answers; some have common knowledge answers. 100 dogs with black & white spots. If you add 1 more dog, what have you got? 100 shoes are on the stairs. How many do we have if we're talking pairs? 100 flowers in the garden and 100 weeds. What percentage of the whole did the gardener plant as seeds? 100 kinds of food to eat. If you enjoy 3/4 of them, what number are a treat? 100 blades of a plant, green and thin, times hundreds more; what are you walking in? 100 pieces of sweet cherry pie. If I keep 25 pieces, what fraction have I? Make a list of 100 animals. Have challenges between 2 students to see who can count backwards from 100 the fastest. Jump up and down 100 times. Build a shape with 100 blocks. Read Young Cam Jansen and the 100th Day of School Mystery, by David A. Adler. Have each child make a 100 Day crown. Decorate it by punching out 100 holes with a hole punch. Using the letters in ONE HUNDRED, make as many words as you can. Make trail mix using 100 items of each ingredient. At a center, have 100 pennies. Have the students sort them into shiny and dull piles. Count and record the number in each pile. At the same center, have the children look for a penny with their birth year on it. How many pennies did they look at before they found that one? Stand on 1 foot for 100 seconds without holding onto anything. Weigh each student's 100 collection. Which collection weighs the most? Which weighs the least? Great list, Barb! I still haven't finalized my plans and our 100th day is next week. It happens to be on my 40th birthday. I told my husband that I don't mind turning 40, but I don't like dressing up like I'm 100 on that day! Anyway, I really like the song you listed. 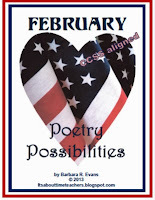 I've seen other poems & songs that didn't quite fit for my classroom. This one is perfect. Thanks! Happy birthday, Melissa, a few days early. I'm so glad you like the song. Hopefully, this list will help you finalize your plans. Enjoy!